Note: I know this is a long article, but hey, read it anyway - it's one of the better ones. Comments are welcome. And remember: click on pictures for larger versions. Dear readers, the webmaster grabs the occasion of 2012 being around the corner to do a status on 2011. The marching team changed its name, got a transfusion of young-blood members, and tried their feet with both well-known as well as wholly new marching challenges. This year was also one of remembering the ones we lost on the field of battle. A year with a lot of Beagle Boys marching is drawing to an end. From from my personal perspective the string of official events started with a DANCON March in Afghanistan in early January and ended with Moesgaardvandring, Århus, in November. Two loosely scheduled marches in December were no shows because of an extreme hangover and time constraints, respectively. Left: The author of this article was lucky enough to be in transit in Kabul International Airport just when the Kabul DANCON March was being conducted in January 2011. Here I am with two Danish and an American friend prior to the start. The DANCON March of my own unit took place in October 2010 and you can read an English language photo report here. In the time in-between, the highlight as usual must be said to have been the Four Days Marches in Nijmegen. Beagle Boy veteran Per Ole Fyhn, a.k.a. P.O.F. DADDY, took care of organizing a team of regular duty personnel from our regiment, The Royal Life Guards, Denmark. 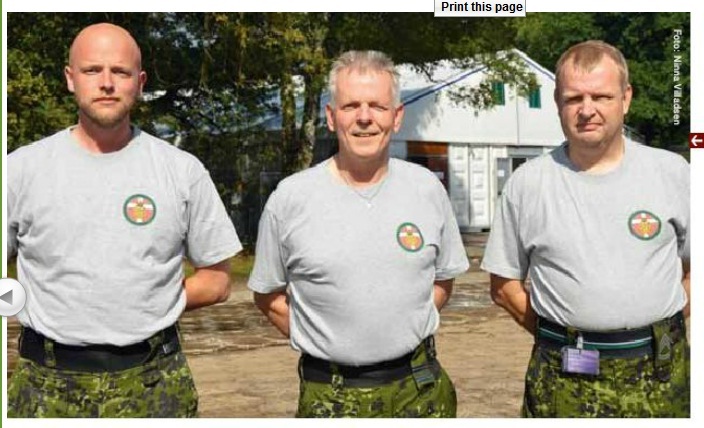 The only two marchers not having their full-time job in the Army were Lance Corporal (r) Morten Bargisen and yours truly. No less than 20 marchers in all, we were. To constantly procure liquid marching fuel in the form of cold beer, alcohol bitters, plus loads more beer on top of that, the team had two trusty bike orderlies, one of whom was from the Danish Home Guard. 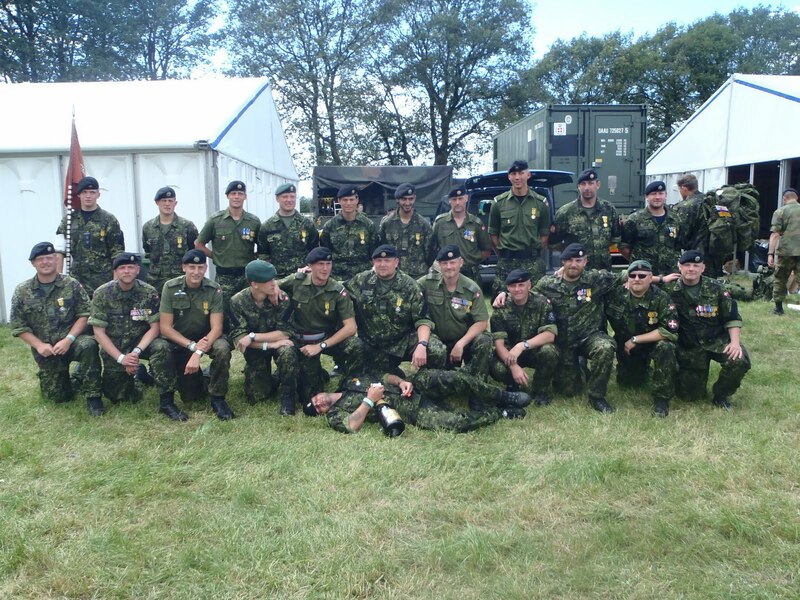 Right: The Headquarters Company/I Battalion/The Royal Life Guards after the successful completion of the Nijmegen Four Day Marches of 2011. Spot the Beagle Boys yourself. The Beagle Boys were also represented in a Home Guard team by former guardsman René Lyholm. Most unfortunately René's knee was totalled before he had even broke a sweat on his brow in Nijmegen and he was forced to quit. Fortunately, René has returned in good shape and completed tough marches in the autumn. This year in Holland really was a fantastic party and definitively one of the best Nijmegen years for me. 13 out 20 our team marchers were first-timers, and yet everybody made it to the finish line. Speaking for myself it was good fun meeting these full-time colleagues of Per's for the first time, most of them young lads. Left: One of the lads carried a magnum bottle with him during Day 4 and surprised Our Beloved Team Leader: the moment Per Ole had been awarded his medal, as the last one of us, precious champagne was sprayed on him. Luckily there was still enough to go round afterwards. 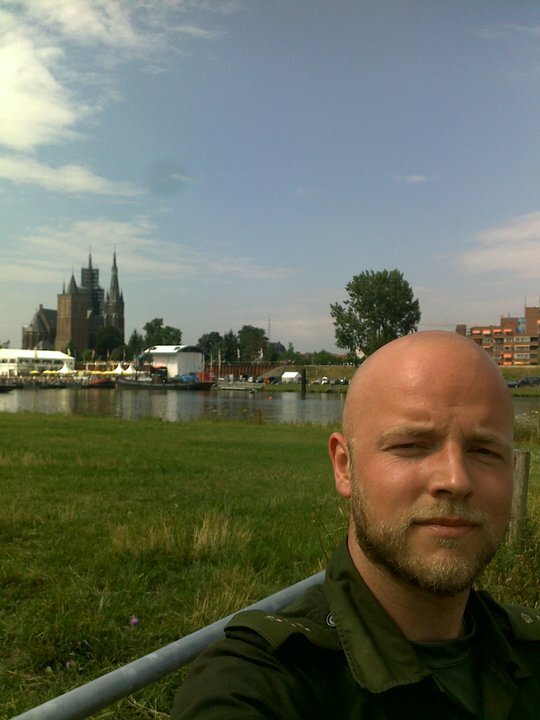 Again speaking for myself, Nijmegen 2011 was also a week of getting to know better some of the people that I may have been acquainted with for years in the camp, but only peripherally. Plus, of course, there is the ever joyful feeling of hanging out with the friends, from Denmark and elsewhere, whom you have made already in Camp Heumensoord through a decade of marching. Laughing and toasting with friends also make you think of the ones who are not there. ... We will remember them. So goes the final lines of the famous WWI poem "Ode of Remembrance" by Laurence Binyon. A vivid moment for all Danes present in the Beer Tent on Thursday 21 July in the afternoon will be the tribute to fallen Lance Corporal Jørgen Randrup. Randrup stood no chance of survival when he was blasted by an explosive device in Afghanistan on 14 November 2010. The Lance Corporal hailed from The Royal Life Guards, and his colleagues from his regular marching team entered the tent clad in T-shirts with a motif honouring him and to the sound of his favourite tune in the loudspeakers. Left: Lance Corporal Jørgen Randrup, The Royal Life Guards, Denmark. Let me underscore that I did not now Jørgen Randrup well; but I imagine I would have after some more years in Nijmegen, just like with the people I got around to talk to this summer. I certainly know who he was, because he was charismatic, tall as a tower, and with the stamina to party to the very morning and then let his long legs bear him through another day of festivity along the route. You noticed him, a picture of how you do military road marching best, in my opinion: spreading good karma, being tough enough to party hard and still walk 40 kilometres a day with a bergen like there is nothing to it. So it was with a lump in my throat I saw all the flags from the Danish, Norwegian, and Swedish teams lined up on one side and being lowered when the late soldier's mates marched in with uncharacteristically solemn faces. Looking around me, I could see his friends, many of whom are my friends, clearly affected. The glossy eyes could not but touch me as well: a considerable number of us have been in Afghanistan, and the feeling of comradeship and a shared loss was strong. None the least for those of us also from The Life Guards. Hugs and a few words were exchanged all around afterwards. It was, all in all, a beautiful tribute, done just the right way. Life goes on, but we do, indeed, remember him and all the others, and we toast them when the first glass of port is lifted at any march. For those who do not already know, a friend of mine from across the Atlantic did a very tough endurance run in memory of Jørgen Randrup. 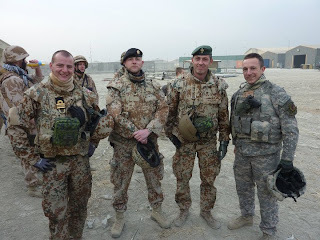 Right: Mr James Armstrong is an American viking who most generously shipped so-called care packages to my Danish colleagues and me during my deployment of 2010-2011, even though James and I have not (yet) met each other in real life. 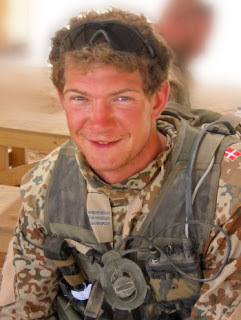 Follow this link to see him struggling in honour of Lance Corporal Jørgen Randrup, or just notice the picture he is holding and the text on his arms before the run. I think it is worth spreading the word of how the death of this fine soldier made an impact far from his own country. Another person who made a great and positive impact on the lives of a large number of people is the man who made our marching team change its name. Bjørn Richard Kærgaard "BRK" Jensen tragically died in a traffic accident on this very day two years ago. In another posting this year, we have stated the background for the name "Marchteam Bjørnebanden" / "March Team the Beagle Boys". The idea to change the name is also the indirect reason that the blog you are reading came to life again after a couple of very silent years. There are few more words to say on that matter: Bjørn is remembered by each posting on this blog and every time our little group do a march together, be it just training or an organized event. Left: An epic pic of the 2009 marching team in Nijmegen, BRK seen to the far left. During a late night over beers at the Fulda March in Germany this year, Morten, Per Ole and I shared the same sentiment when someone brought it up: we should include more people in our circle. I sincerely believe that this is in the spirit of Bjørn. 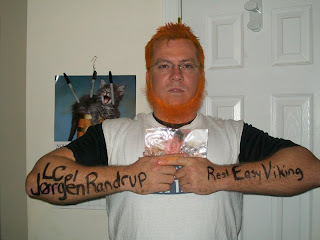 He was always an extrovert, and he was very enthusiastic about the GEMCEEs (our former denomination) being a group, a unit with their own website putting our mark on the Danish marching subculture. So that night in Fulda the present ones of the old core of Eritrea veterans decided that we should invite some of the "new guys" to be part of our quite informal group. You can see the names and ugly mugs in the section dedicated to that purpose. Let me move on now, because I do not believe that Bjørn should want me to dwell more on the sad parts of this year, but on life on the road! One of his section colleagues from Eritrea took on a great endeavour, for example. Retired Lance Corporal, now an executive in Statoil, Robert K. Steffensen currently takes a break from all the party-harty march trips of the rest of the team, but that didn't stop him from planting a massive Beagle Boys banner on Spanish soil in the spring of 2011. Spain - the ones a little bit interested in hiking will guess where this is leading. Yup, the ancient pilgrimage route known as El Camino de Santiago. Four weeks, 780 kilometres and wham(! ), you have an experience for life. Right: Robert at the highest point of the four-week hike in Spain. To be honest, most of all this marching hubbub is just that: hubbub, beers, and socialising. Robert turned a new page in the team's history by putting on his rucksack and doing this long hike in solitude, in the company of silent nature and with the privacy that gives room for contemplating one's life and the world in general. There really is a world of difference between that and the throng of 40,000+ marchers crammed together on Dutch roads to the sound of entire towns partying along the route. The present writer has definitively been inspired to undertake El Camino sometime in the future, when the calendar and life's circumstances allow. Quite likely on my own as well. Robert wrote an article about his experience; it's in Danish, but peppered with pictures. Go have a read and a look. Non-Danes are even allowed to use Google Translate. Yes, it's true, go ahead. Next: Marching for the beer and the ballgame! Another quite long-distance solo - albeit in a different manner - trip was conducted by myself: the so-called eXtreme March in Lithuania. Two times 100 clicks in two days, with a merciful 24 hours of relaxation and socialising in between. It was an awesome experience, and come to think of it, the eXtreme and the whole Lithuanian holiday surrounding it was actually the marching highlight of my year. Considering how great Nijmegen 2011 was, that put things in perspective. 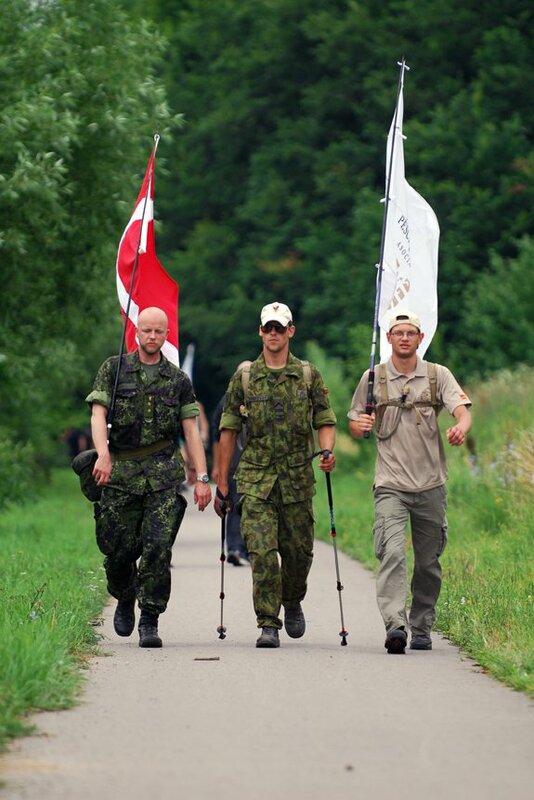 Left: Thorbjørn, Max, and Andrius having a walk in the allegorical 200 kilometres long park. I have already documented the trip in a Danish language article rich in pictures, so now I'll let do with sending the warmest of new year's greetings to the friends I made in those days, and for sure also to the Lithuanian colleagues from Afghanistan whom hosted and partied with me in Vilnius, Siauliai, and Kaunas. Thank you all so much, we'll meet again, and you will always have a bunk in Copenhagen if you want! Apart from these major events and a couple of other organized marches (check this link to see the overview of the ones I did in 2011), we have done as we always do, namely "training" in a, I'd say, very loose and informal manner. A good example was meeting up at Vesterbro Torv in Copenhagen on a late summer Sunday morning and then setting off for Glostrup Stadium to watch a football match between the local heroes versus Per Ole's life-long love relationship of Hvidovre IF; a club which at least the Copenhagen branch of the Beagle Boys have been slowly indoctrinated into following (for the record I will note that my main team will always be F.C. Copenhagen!!!) at live games. You would think 15 kilometres like that would be done in a whiff, but it can take quite a long while when you visit five bars on the way ... That's the way we roll, now and again, at least; skim through this 2007 picture report for grim proof. 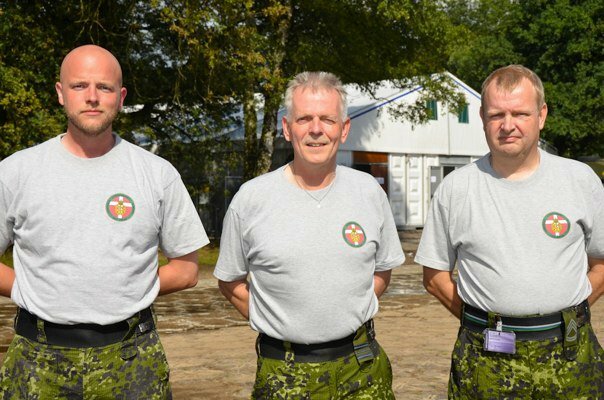 Right: Three of the four organizers of the March Kopenhagen to Nijmegen (MAKONI): Thorbjørn, Home Guard Captain Jens von Østrup, and Home Guard Staff Sergeant Helge Larsen. Magazine article here. This signature is the Beagle Boy whom has worn his boots the most this year, on the roads, anyway (giving a well-deserved nod to Per Ole's countless combat patrol exercises in his unit), closely followed by Santiago pilgrim Robert. 11 official marches I have done; more individual events for me than ever before in a calendar year, and being equal to around 1,000 kilometres. 2012 will be even crazier than that, though. Like in 2007, a number of not-quite-right-in-their-heads marching fanatics from all over Denmark and elsewhere will train for and conduct the 650 kilometre trip from Copenhagen to Nijmegen, all in 16 days total, followed up by the "normal" 160 kilometres of the Nijmegen Marches. I am part of organizing the time-consuming ordeal and will thus participate for sure. Per Ole wants to, but his duties with the regiment will be the deciding factor in the end. Here's fingers crossed for the schedule and the powers that be to be indulging for POF Daddy. Also it will be interesting to see how matters will progress with the Dutch Armed Forces considering cutting a considerable amount of support for Camp Heumensoord, centre-piece for the military presence at the Nijmegen marches. Here's all fingers and toes crossed that they will find a tolerable comprise. Support the cause by becoming a "fan" of this Facebook page. Left: Bling-bling! My finely honed sense for procrastination, the ownership of a professional photo camera, and some cleaning up of the flat had consequences for the blog: my medal and coin collection was elevated from lying in a plastic bag in my Afghan treasure chest to being arranged on the filt board of said chest. A complete overview of the souvenirs earned through a decade+ will follow in the beginning of January. No matter what, one thing is for sure: if you do some marches yourself in Europe in 2012, it's quite likely that you will run into one or more of us. You be hereby warned! Finally: happy new year to our increasing amount of readers. Please, if you enjoyed this article or the blog on the whole: spread the word, for example by sharing the link on Facebook. It's extremely satisfying that we have had so many hits since the blog was reinvigorated in August. 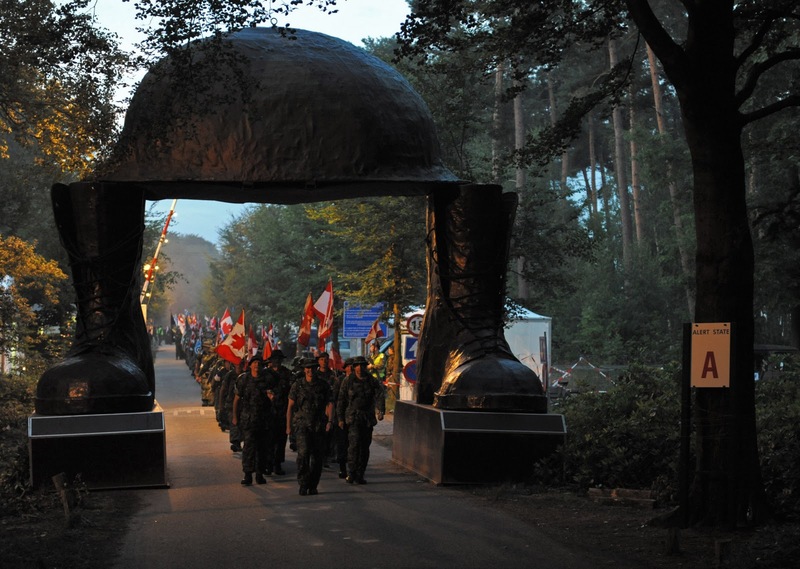 Yesterday, a Dutch newspaper reported that Camp Heumensoord, arguably the centre-piece of the Nijmegen Four Day Marches, will cease to exist from year 2013. UPDATE, 10 Dec: Please become a fan of the Facebook Page in support of Heumensoord. Go to the page by clicking here. Oh, but man. I bring the non-Dutch speaking part of the international marching culture bad news here. One of my comrades-in-boots from the Danish roads posted a link to de Gelder on Facebook tonight. Basically, the article quotes Four Day Marches Chairman John William Stein for saying that he expects dire effects on the march from planned cuts in the Dutch defence budget. at the entrance of Heumensoord, earley in the morning. The effects of the cutbacks will be "limited" next year, assesses Mr Stein, but not so for the 2013 march. Then, he fears, there will be no Camp Heumensoord in the woods outside Nijmegen and no pontoon bridge across River Maas at the town of Cuijk on day four. Both camp and bridge are constructed by Dutch Army Engineers. As a soldier it is hard to imagine how it would be to not be living in Heumensoord during that week. 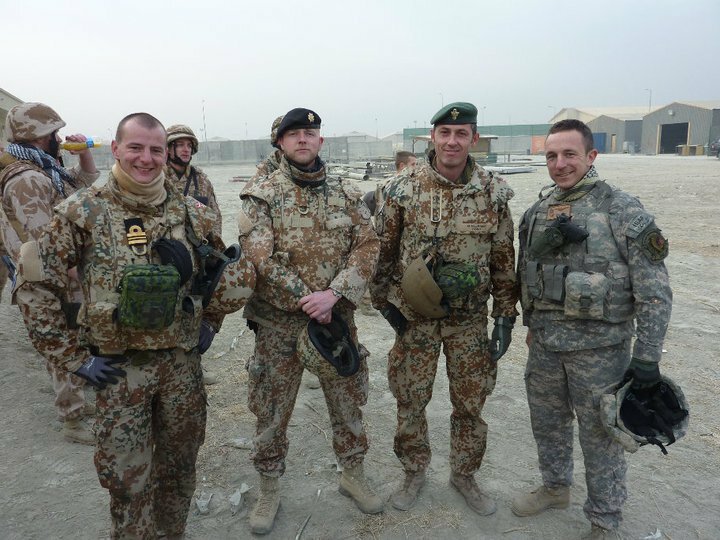 The comradeship between the many service members from all over Europe - indeed, from all over the world - is such a huge part of the experience. I mean, we don't walk six-seven-eight hours just for the spectators and the party out on the route. OUR party only truly begins when we march into the infamous Beer Tent to the cheer and singing of our colleagues. We can only hope that somehow the Dutch Minstry of Defence will realise just how great a brand the Four Day Marches are for not only the city of Nijmegen, but also for their Armed Forces, and find some of the money for a compromise. Below: a video shot by Leo, the Dutch Viking, featuring several Beagle Boys: the HQ Coy of The Royal Life Guards, Denmark, doing their traditional Beer Tent Entrance Stunt, july 2011.
iconic bridge across the Maas, July 2009.